Do you like A Estrada? The first part of the fiesta is getting the horses from the hills into the town (this happens on Friday), and the rest of the weekend is devoted to cutting their hair. 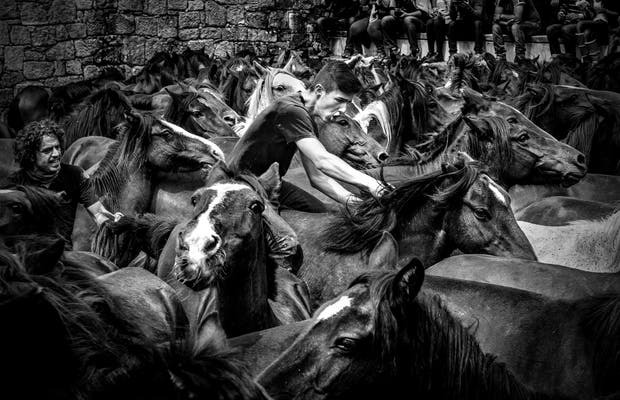 To do this, they cram as many horses as will fit into the "curro", a circular corral with amphitheatre seats, and the participants launch themselves onto the horses to cut their manes and tails. Many of the horses get nervous and so many of them are brought to the ground so that their hair can be cut in safety. The fiesta is pretty spectacular not only for the horses, which are gorgeous in and of themselves, but also for the sheer amount of horses and the techniques used by the participants to cut their hair and tails.